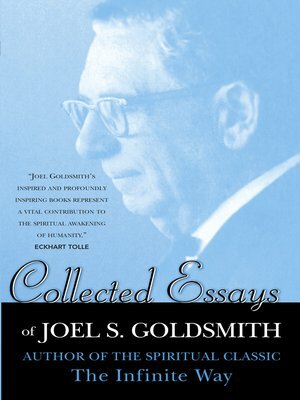 Collected Essays is an anthology of Joel Goldsmith's smaller works and booklets that weave the Infinite Way principles into a variety of timely topics. It gives the reader a broad sampling of Goldsmith's spiritual wisdom. The book includes these titles: "Supply," "Metaphysical Healing," "Meditation," "Prayer," "Business," "Salesmanship," "Ye Are the Light," "The Real Teacher," "The Seven Steps," "Truth for Business and Professional People," "Secret of the 23rd Psalm," "Love," "Gratitude," "I Am the Vine," "Deep Silence of My Peace," "Fourth Dimension of Life," "Contemplative Meditation with Scripture," "Easter of Our Lives," and "A Lesson to Sam."